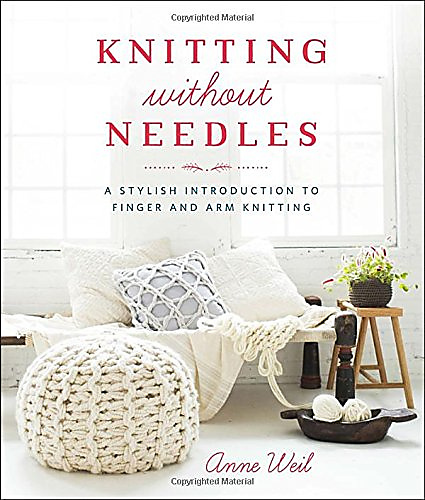 $15.99 on Amazon look inside this book! You’re never too young for luxurious baby alpaca. 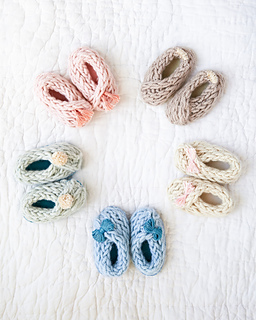 These incredibly soft booties were born to keep baby’s feet warm in style. With felt soles stitched to the bottom and unique embroidery-thread embellishments topping each pair, everything about these booties tells the receiver how much you care. These booties are constructed by attaching the finger knit strand back to itself and then folded for the adorable bootie shape. 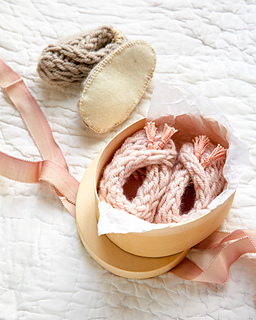 Thread elastic through the ankle to make the booties even more secure. Embellish with adorable embroidery thread pom pom or tassel or bow. 22 yards of Worsted/Aran Weight yarn per set of booties. I used Purl Soho Alpaca Pure in Ballet Pink, Artemisia Green, Ice Blue, Sea Salt and Heirloom White. 1 skein of DMC embroidery thread per set of booties. I used DMC size 5 pearl cotton in Ecru, 352 and 597. Also DMC Mouline Color Variations in 4170. 8x10 piece of felt. I used Purl Soho Wollfilz Fet Bundle in Anemone for all pictured booties.